I Am Livia is a “must read” for anybody who loves well-researched historical fiction about fascinatingly strong women of history who lived in challenging times, achieved power and/or influence and deserved to be remembered for her own contributions and not just her association with a powerful man or family. Livia Drusilla, wife of Caesar Augustus, mother and grandmother to future emperors, and daughter of a Claudii patrician who supported the assassination of Julius Caesar, recounts her life in a first person narrative beginning with her marriage at age 14 to a much older man, Tiberius Claudius Nero, through the civil wars that culminated with the death of Antony and Cleopatra, and the imagined relationship with Rome’s First Citizen. The narrative flows nicely and this is a fairly quick read. 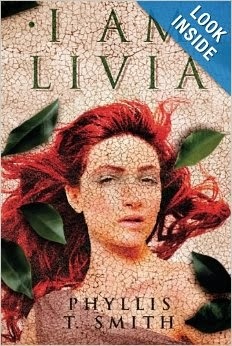 The author makes an effort to rehabilitate Livia’s reputation as a power hungry woman who poisoned her enemies or family members that might conceivably vie for political control. The only parts of the book that didn’t resonate well with me were the depictions of Caesar as completely a besotted suitor and husband. The dialog felt awkward to me. For those who hungrily devour stories of this historical period, loved the Masters of Rome series by Colleen McCullough or stayed glued to the HBO series “ROME”, this story is peopled with characters that feel like old friends. Disclosure: I received a free advance copy of this book through Bookbrowse.com "First Impressions" in exchange for my review. The book will be available on Amazon.com in April 2014.